I've been very busy over the past several days. I've enjoyed some delicious drinks. I spent the next day at my roommate's real house at her Going Away to Germany for the Summer/Fake 21st Birthday Party (she's turning 21 over there where it's not quite so important). I reluctantly sampled some of the amazing pina coladas that her dad made, but just a little bit of rum after a raucous Memorial Day weekend made me a tad bit queasy. On Monday night, my mom arrived into town after a 10+ hour trip from Vermont. While we were both beyond exhausted, we managed a nice little trip for some Razzy Fresh fro yo before passing out. Peanut butter + chocolate and sprinkles never tasted so good. I woke up on Tuesday with a pounding headache, sore throat, achy joints, and a super congested nose. I rallied enough to eat at my new favorite veg restaurant in Pittsburgh: The Quiet Storm. Their hash browns, eggs, cheese, and soysauge were quickly inhaled, but I think they may have just enhanced my miserableness. BUT it was even better to get a first hand glance at this girl. That's RIGHT people - a real, live sighting of Dianna Agron right here in Pittsburgh. Skeptical about a girl this gorgeous running around the Steel City? Well, so was I, but according to her twitter and a report about a new movie that she's filming here in the Burgh, she has every reason to be around. Her voice sounded the same and she was with an incredibly gorgeous man, and I'm sure it was her. She had no makeup on, her hair was fresh from a shower, and she was wearing a pretty blue sundress and holding a rather beautiful bag. I'm not the sort to interrupt a fellow museum goer, so I let her appreciate Andy and all of his pop art in peace without telling her how much I love her on Glee. Since I was pretty delirious and rather dehydrated, we made our way to Church Brew Works for lunch. 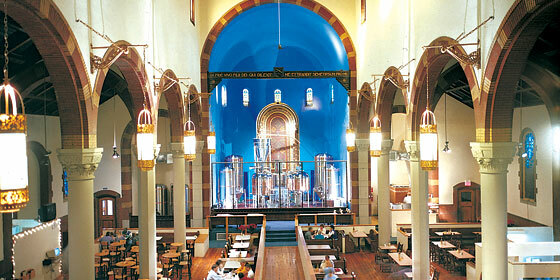 It's an old church that's been turned into a microbrewery. The altar area, confessionals, some pews, and plenty of stained glass are still very intact, making it feel very odd to sip on a beer (all really good) and smell the slightly off scent of hops wafting around the sanctuary. After a delicious meal and a beer that I couldn't bring myself to finish (I was definitely sick - I'm not one to ever waste alcohol, especially a glass of which that cost over $5), we spent the afternoon shopping in South Side. I managed to forget the 20% off coupon for H&M, so neither of us ended up going to crazy in the early summer sales. We made our way to Yo Rita's on E Carson St for dinner. I'd read a review of this place a month or two ago, and it did not disappoint. Known for their unique take on Mexican food, I had an amazing bowl of vegetarian tortilla soup (the seitan was mind-blowing) and an asparagus taco. My mom had an asparagus salad and crispy eggplant taco. The free tortilla chips and salsa were just icing on this amazing and reasonable priced meal. More than half of their menu was specialty drinks, too, so I'll be making another appearance with my roommates in the very near future. Even though it was only about 7:30 pm, I dropped my mom off at her hotel and made my way home to sit on the couch and watch Glee. I think I'm even more obsessed with it now after my spotting. I felt even worse the next morning, but I managed to wake up and take my mom to the Juicebox Cafe in Shadyside for a late breakfast. I've wanted to go there after Betsy gave it a pretty good review. They don't really have breakfast food, but a mock tuna wrap and a Barry Manilow smoothie were great ways to get my day off to an OK start. My mom went on her way after taking me to Trader Joe's, and then I tried to walk to my afternoon shift on campus. However, a certain visitor made my trip a little longer than I'm used to. 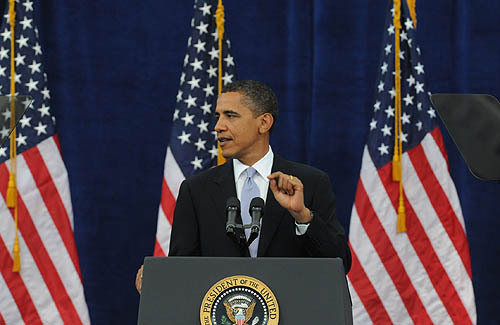 Yup - Obama made an appearance at Carnegie Mellon on Wednesday. They were very secretive about this visit. They invited a very select group of University affiliates, didn't tell us why or when he was coming, and kept everyone else pretty far away while he was speaking in our gym. This POTUS did manage to make me 25 minutes late for work, but I'm a pretty big fan so I'll forgive him. Since then, my head cold has only gotten worse, and today is the first day I've managed to stay at home all day, call off sick from work, and do absolutely nothing in my cave of a room. I did get to watch New Moon last night. I've made a point to stay away from the Twilight franchise, and while I'm not a huge fan of the male-dominant plot and overtones, I do appreciate Taylor Lautner's back muscles. Robert Pattinson's looked a little too deathly pale for my taste, but I'll take that werewolf's abs any day (as long as their isn't a full moon). Have you ever had a celebrity sighting? Last summer I saw Alexa Chunch going into Opening Ceremony in New York. I love her, so that was pretty exciting. Have you had the chance to see Obama up close and personal? My first ever political rally was to see Michelle Obama during the presidential election. She's tall, beautiful, brilliant, and a great dresser, so she has set the bar pretty high for any future speeches I see. Team Jacob or Team Edward? Dear God, I never thought I'd want to ask that...but I am.